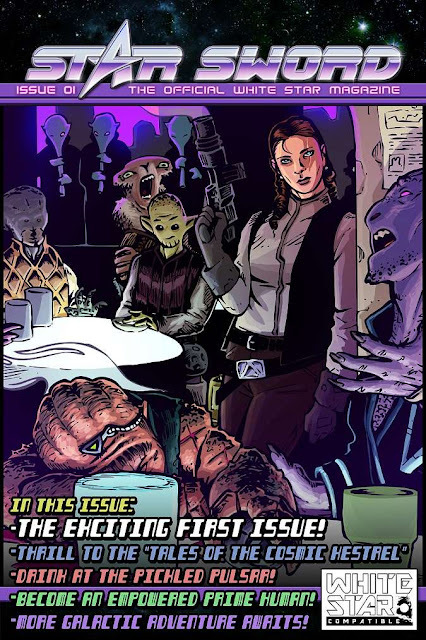 Welcome to the exciting first issue of Star Sword: The Official White Star Magazine! Each quarter you'll get the original content from across the galaxy! Each issue will feature new fiction, new classes, new equipment, adventure seeds and plot hooks, and thrilling sci-fi heroics as infinite as the stars themselves! Thrill to the Tales of the Cosmic Kestrel! Discover the heroic powers of Prime Humans! Arm yourself with Gunslinger Gear! Be drawn between Star and Void as you use your Knight's Gambit deck to discover The Blade's Way! Star Sword: The Official White Star Magazine is designed for use with White Star: White Box Science Fiction Roleplaying and White Star: Galaxy Edition, but all the material can easily be adapted to any classic OSR-style roleplaying game. What's that? You don't own White Star? You do realize that White Star is currently PWYW, both in PDF and Print (minimum cost for print to cover, well, the printing) - Go grab your copy, then come back and grab your Star Sword! Cool cover! I assume that most of the content will be usable with a variety of systems. Glad to see this out! I've been running Traveller lately, but want to get back to White Star. I keep running Traveller like this: "Once again you get through customs and bribe the correct officials to look the other way so you can carry a personal side arm through checking. You then head to your broker to load up on trade goods. Meanwhile, across the street you watch as a team of White Star adventurers explode a hotel and blast in to space where they are about to take on the might of the Quinlon empire in order to keep your Traveller PCs safe and secure in their little business." ....Yeah, we gotta get back to White Star soon.